My name is Jim. I am a disabled Vietnam Veteran living in Thailand and have been for 5 years now. My wife's name is Mae/Mare/Roongnapa. We met a few years ago and has been my wife for almost 3 years now. Very happily. Mae is the joy of my life. I never thought I would meet a woman who cares for me, shares with me and is a dream to be with. Being on a small income from Social Security & Veterans Administration prevented us from going on really any sort of a honeymoon. So this first is about taking a Honeymoon. Somewhere where Mae has never been before. The second part of this campaign is for us to move to America. 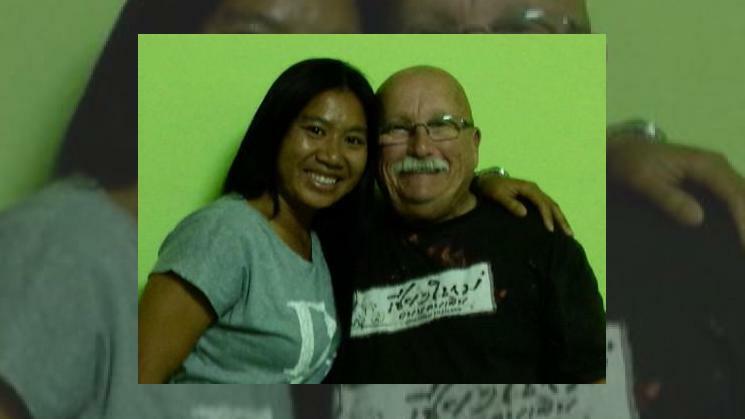 Mae has never been to America; has seen bits and pieces about America in movies, tv shows and talking with other Thai ladies who have been to America. All she has seen has prompted her and us to move to America. The opportunities are endless for both of us. With the spousal visa Mae will get, she will receive immediately upon arrival a green card. That will enable Mae to be able to work while at the same time enable her to travel back and forth between Thailand and America for family visits. I have not been able to work in Thailand and I do miss working. The work laws for foreigners truly prohibit most who wish to do honest work in Thailand. So I will be able to join the employed rankings when I get to America. One other benefit for me will the ability of getting unlimited at no-cost medical support from the VA Hospital located in Seattle, WA where we will be living. So all in all, the campaign is to help us in combination of a belated honeymoon, a move of house and home to America and finally rebuilding our lives there with automobile, insurance, housing, work clothes and an early trip to the VA for medical attention that I have been putting off here in Thailand. Thank you for reading this. The words all come from our heart and hopes that you are having a good day. Mae and I both thank you.